내 결혼식 사진 봤어? 결혼식 사진 봤냐고. 내 들러리 슨거 봤냐고? 으허허허 하하하하. 우리 단체 있던 앤데 단원이 결혼하는데 유청남씨랑 나랑 양복을 입고, 남장을 하고 신랑 들러리를 섰지(…)내가 순천여자하고 결혼식한 사진도 있어. 애기까징 낳고 젖먹이 띠어 놓고 내가 좋아서 이리까지 찾아왔어. 순천서 공연할 무렵에 순천서 찾아오는 여자 중에 예식장을 하는 여자가 있어. 그래서 우리 단원들이 전부 하객이 돼가지고.. 사진이 그렇게 나와 있어. 그 여자가 웨딩드레스 입고 나는 모닝구입고...결혼식하면서 그런 사진을 찍어보자고 그러더라고. 그래서 그러자 그랬지 뭐라고 그래? Did you see my wedding picture?Did you see? Hahaaaaa..ahaaa….When the member of our troupe have got married, Yoo and I have worn the suit, like men, and been best-men for groom. 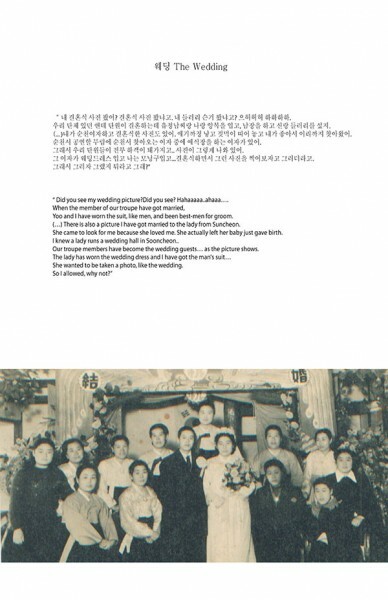 (…) There is also a picture I have got married to the lady from Suncheon. She came to look for me because she loved me. She actually left her baby just gave birth. I knew a lady runs a wedding hall in Sooncheon.. Our troupe members have become the wedding guests… as the picture shows. The lady has worn the wedding dress and I have got the man's suit…she wanted to be taken a photo, like the wedding. So I allowed, why not? 칼을 하도 잡아서 (팔뚝을 가리키며)여기가 이렇게 나왔었어. 주먹도 크고. 남자가 와서 눌러도 (팔뚝이)딴딴허니 안 들어가. 칼이 톱날같이 됐었어. 하도 부딪쳐서. [...] 한번은 상대역이 나를 잘못 쳐가지고 너무 위를 쳐가지고 약국에 가서 붕대를 사서 두 손가락을 묶었잖아. 그러고도 공연을 했지. 이 손 맨 숭터였었어. [...] 애 가져서 여덟 달 되어가지고 을 했다구. 나는 아무치 않아. 객석에서는 (임신했는지를)몰라. As repeatedly held and held the sword, here got overload like this. Feast was that big. If man pressed, my arm was still hard. The sword blade became changed into like saw's. It have crashed hundred times. (…) Onetime a colleague put me some terrible way and hurt me. But I did play even though I had to put a bandage around my fingers. There were hundred of scars on my hands. (…) I actually did perfume Romeo and Juliette during 8months pregnancy. I was ok. No audiences knew I was pregnant. 어떻게 하면 더 남자답게 보일까. 더 악랄하고 더 나쁜놈으로 보일까… 턱.. 이렇게 여자를 안고 딱..이렇게. 근데 내가 그 전에 쌍까풀 수술을 한거야. 그래가지고 어떻게 하면 이것도 숨기면서 배역에도 몰입할 수 있을까.. 그래서 이렇게 안대를 쓰고 애꾸로 연기하는 아이디어를 냇지. How could I look more masculine? More brutal, more bad guy…held the woman like this..just like this. But, problem was that I just have got plastic surgery on eye rid. So I came to think how I could focus in my role for the play as well as I could hide the surgery thing. That's why I gave the smart idea being a one-eyed man.